THE ADRIATIC SEA (in Italian “Mar Adriatico,” in Serbian “Jadransko more”) is a northwest-to-southeast arm of the MEDITERRANEAN SEA. The sea separates the Italian peninsula from the Austro-Hungarian, Montenegrin, and Albanian littorals, and the Italian Apennine Mountains from the Balkan Dinaric Alps. The western coast is Italian and the eastern comprises Slovenia, Croatia, Bosnia and Herzegovina, Serbia and Montenegro, and Albania. 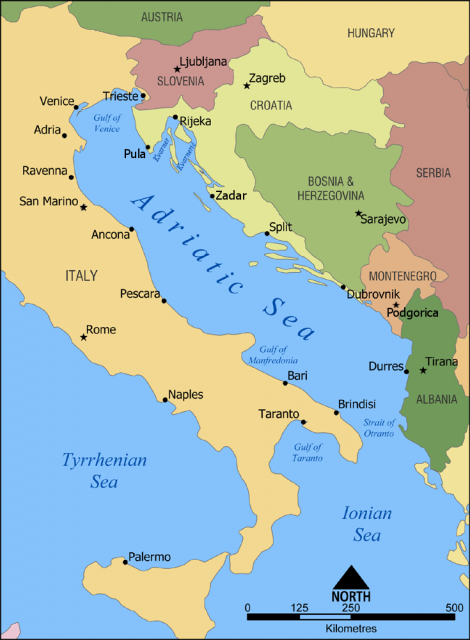 The name derives from the Italian town of Adria (Hadria), designating in early historic times the sea’s upper portion. The term was later extended geographically to the south. The Adriatic has a total surface area of about 60,000 square mi (160,000 square km), with a maximum length of about 480 mi (770 km) and a width of nearly 100 mi (160 km); however, the Strait of Otranto, connecting the Adriatic and the Ionian Sea to the south, is 45 mi (72 km) in breadth. The mean depth is 133 fathoms (240 m), but the northern portion of the Adriatic is shallowest between the southern promontory of Istria and Rimini (about 25 fathoms or 46 m), where the low Italian littoral merges in the northwest into marshes and lagoons along the delta of the Po River. The freshwater Po and Adige are the major rivers flowing into the saline Adriatic and account for substantial silting. The Po’s sediment extended the coastline for 2 mi or 3.2 km within the last two millennia. The area between Šibenik and Ortona (Croatia and ITALY) exceeds 100 fathoms (180 m) in depth, but west of Durrës (Albania) and south of Dubrovnik (Croatia), the basin exceeds 500 fathoms (900 m). The rocky east coast has many long and narrow islands with the long axes lying parallel to the mainland coast and elevations of a few hundred feet; larger islands such as Brac have elevations of 2,552 ft (778 m). There are more than 1,000 islands in the Adriatic, although only 66 are inhabited, notably near Venice (Italy), and Trieste (Italy). Due to eutrophication and minimal tidal flow, making the sea a shallow, closed system, the Adriatic has notable water and air pollution yet remains an important tourism and fishing locale.